The brains that will power your next laptop are here. Intel's just taken the covers off the high-powered versions of its new Broadwell architecture. That is to say, the 5th generation Intel Core i3-i7 chips that will make your next laptop better than ever. Broadwell chips are already out in a bunch of ultra-slim convertible devices, in the form of Intel's Core M chips, desktop-tablet hybrid brains that run on crazy low amounts of power and drive 2-in-1 tablet devices and dumb thin fanless laptops. Now, more powerful ones are on the way, the first of which will be showing up as lighter, dual-core Core i3, i5, and i7 chips, with the beefier quad-core models coming later this year. These new 5th generation Broadwell chips have a lot in common with their predecessors—those 4th generation Haswell chips that brought big battery life improvements—but aren't nearly the leap Haswell was. Broadwell is the "tick" in Intel's "tick-tock" update pattern, the step where Intel takes last year's chips and just shrinks them down instead of breaking out a whole new architecture. To that end, Broadwell is a 14 nanometer process as opposed to Haswell's 22 nanometer process, despite rocking 35 percent more transistors; Moore's law at work! Naturally there are performance gains over last year's chips, but nothing mind-blowing. CPU gains are pretty marginal, but Intel says Broadwell will offer 20 percent better graphical performance than Haswell did, letting Intel HD, Iris, and Iris Pro graphics get a little boost even if they can't tackle serious next-gen graphics. Similarly, Broadwell should offer a battery life boost, but nothing near what we got with Haswell. Intel cites an additional hour and a half you could get out of your battery, but that's pretty best-case scenario and how much of those gains you stand to actually see will very from laptop to laptop. That's not to say Broadwell isn't coming with some new tricks, though. Intel's RealSense 3D camera tech allows for Kinect-like depth-sensing computer vision that works without any bulky peripherals, is launching in earnest alongside the Broadwell roll-out. There were a handful of demos of the tech at least year's CES, showcasing everything from gesture-controlled games to 3D photographs, and we also saw it shown off in Dell's swanky Venue 8 7840 tablet that likes to pretend it's a Lytro camera. Now those tricks will be coming to all kinds of laptops; Acer's already announced its new Aspire V Nitro will ship with the tech and you can bet there's more to come. Likewise, Intel's support for voice control is also going wide with these Broadwell chips, so the voice assistants we've had on our phones for a few years now can finally bleed over to the desktop. Select Intel chips have had specialized microprocessors for voice recognition, but with Broadwell they're coming to all of them, alongside built-in support for stuff like dictation and basic PC controls, as well as app-specific capabilities that could include commands like asking Spotify to play a certain song. Expect to see parts of that skeleton inside of all kinds of branded OS-level assistants, like Windows 10's upcoming Cortana for desktop, or a potential desktop version of Siri. Broadwell's advantages come with a caveat though. Due to a ton of delays getting Broadwell out the door, its successor—a big, new-architecture update called Skylake—is not far behind; it's due out by the end of the year. And when it shows up, it's going to leapfrog right over this 5th gen upgrade with its promise of totally wireless PCs. Especially considering that the beefiest, quad-core versions of Broadwell won't make it out until mid-2015. 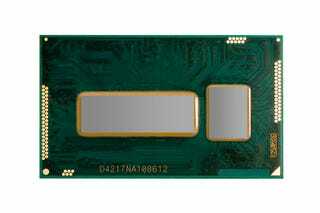 So yes, Intel's new Broadwell chips are the hot new brains for your next laptop but they're a just a little step up from what we already had, and the big step up is closing fast.